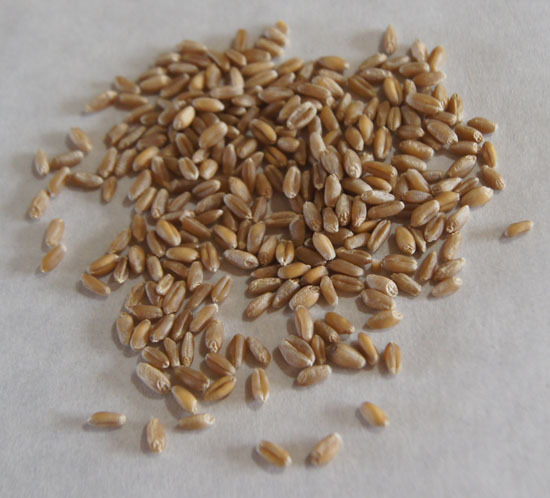 A wheat berry is the seed of any species of wheat. If you buy a product labeled “wheat berries” in our local U.S. stores, it is likely the berry of common wheat, unless it is otherwise specified. All wheat berries are whole grains, as they include the bran, germ, and endosperm. Many species of wheat make up the genus Triticum. The most widely grown is common wheat, T. aestivum. Hard winter wheats are planted in the autumn; flours made from winter wheat have a lot of gluten and are used to make bread flour for yeast bread. Spring wheats, in contrast, are “soft”, and have less gluten. They are blended with winter wheat to make all purpose flour, or used alone for cake flour. Durum is the hardest wheat, and it is usually planted in the spring in the US. Durum wheat is used in making pasta. Whole wheat flour is made from the entire wheat berry, while other flours are made from only parts of the wheat berry. So far I have discussed freekeh, farro, cracked wheat, and bulgur. I need a quick review, so here goes! Freekeh is made from green durum wheat, and farro from a species of wheat that includes spelt, einkorn, and emmer. Both can be found as full berries. 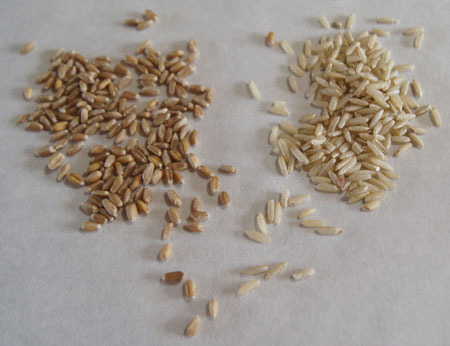 Different treatments such as parboiling, roasting, and cracking or grinding lead to different commercial products: I had cracked freekeh and whole farro. Bulgur and cracked wheat are made either from durum wheat or from a mixture of several different species of wheat – on the internet, one website claims bulgur is an ancient grain. Freekeh and farro are definitely ancient grains. All of the above grains are whole wheat products. Wheat berries are the same as wheat “groats”. The term “groats” is more common when describing oat products. 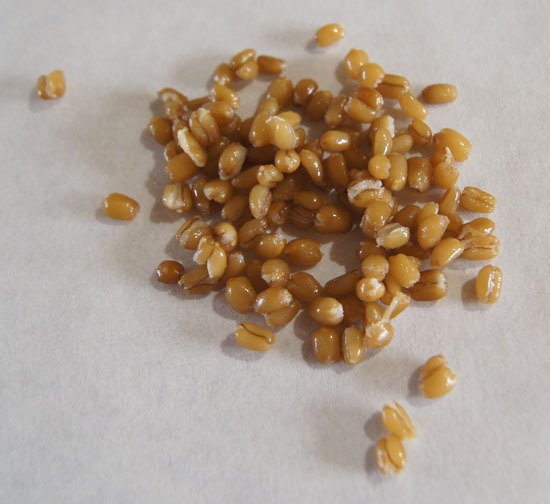 Wheat berries can be cooked and used much like farro, freekeh, bulgur, and cracked wheat. But in the past, I bought them solely for making sprouts for bread. Around the 1970s-80s, “Sprouted Wheat Bread” was popular in local stores. Me the bread making nut wanted to make my own sprouted wheat bread. I came across a recipe in a Bon Appetite magazine calling for milk, margarine, yeast, molasses, honey, ginger, gluten flour, whole wheat flour, white flour, and wheat berry sprouts. I adapted the recipe and made it my own, making changes over the years as I went from hand-kneaded bread to mixer-kneaded bread to breadmaker-kneaded bread. Here is a link to the sprouted wheat bread entry in an old blog that I wrote in 1999. Sprouts can be made from just about any whole seed. You simply soak the seeds in water overnight, drain them, then water them daily and wait several days for them to sprout fully. Sprouts were very popular in the 1970s and 80s, especially alfalfa sprouts (Alfalfas Market in Boulder was named for them). A year or so ago, I decided I wanted to make sprouts again, so I searched local stores. Store after store – but no sprouting seeds! Even at Sprouts Market! I checked the produce sections for prepared, packaged sprouts and even those were sometimes hard to find. After a frustrating search, I finally found both seeds and sprouting jars at the Vitamin Cottage store. (If I was wiser, I would have just searched online, since they are readily available there.) The Vitamin Cottage carries a wide variety of sprouting seeds and jars for sprouting. I bought alfalfa, mung bean, clover, sandwich mix, and wheat berry sprouting seeds. 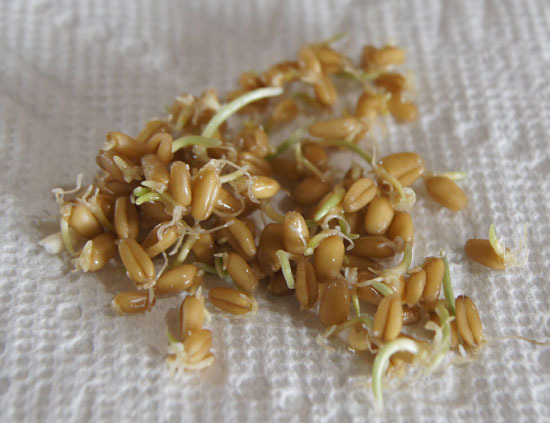 Below is a photo of the package of wheat berry sprouting seeds. Note that the label specifies the wheat as Triticum aestivum. Last week, I found wheat berries sold in bulk at our local Whole Foods. The bin was labeled “hard winter red wheat berries”. They cost a few dollars for a pound (454 grams). 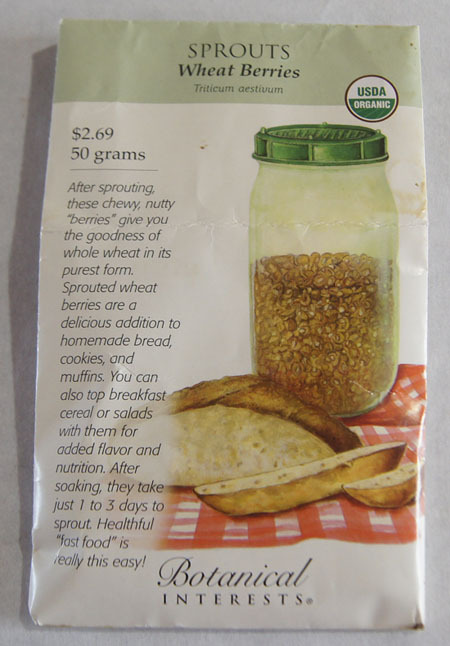 Note that the wheat berries sold specifically for sprouting cost $2.69 for 50 grams! 1/4 cup of uncooked hard winter red wheat berries has 157 calories, 6 grams fiber, 6 grams protein, some calcium, and about 8% of daily iron needs. Source: Nutrition Value website. Wheat berries have a glycemic index value of 41. Source: Glycemic Index (GI) Guidelines for a Plant-based Diet. Wheat berries are a whole grain wheat product. Wheat berries take a long time to cook. Most sources say to simmer 60-90 minutes. Use 1 cup dry berries to 3 cups water. Using a pressure cooker, I found online that they should be done in 15 minutes. That sounds better to me! I have a good electric pressure cooker. if they are not done, cook some more! I liked these! They are as nutty tasting as they look. Crunchy and full of flavor. But tastes differ, and my husband didn’t like them much at all when I used them as a substitute for rice. He called them “rubbery”. Note that the wheat berries I cooked are hard winter red wheat berries. I haven’t tried any other types of common wheat berries yet. Wheat berries can be used as a cereal, in salads, in grain bowls like tabbouleh, as a substitute for rice or pasta, and in breads. I think they would be great added to soups or added in small amounts to salads to provide a bit of crunch and flavor. Mixing with other grains might coax reluctant eaters into enjoying them. And as I discussed ad nauseum in the sections above, sprouted wheat berries can be used in breads. Since wheat berries take so long to cook, it might be a good idea to cook a big batch of wheat berries and store them frozen in small portions. That way, you can pull a few out of the freezer and add them to a recipe in a flash! Wheat Berry Salad from Food Network has wheat berries, walnuts, dried cherries, celery, parsley, green onions, olive oil, and lemon.